In part one of this two-part blog series, we'll walk you through the process to define Product Data Management (PDM) variables, manage data cards and designate properties in Microsoft Office. Watch the On-Demand Webinar below, or follow these steps for an easier experience navigating SOLIDWORKS PDM data management software. First things first, if you have not already defined your variables in SOLIDWORKS PDM, then you must create them in the Administration tool. After doing so, you can then link the variable to certain file types, such as Microsoft Office. To do this, create a block using the appropriate name, for an Office document, it will be a Custom Property. Next, give it an attribute name, typically representing the variable name. And lastly, define the desired file extension for the attribute mapping to be valid. Once this file attribute mapping is established and we check-in the mapped file types, the database variables that are stored on the data card will be pushed into the file. Likewise, if a file is checked out and the mapped properties are updated in the document, they will be displayed on the data card upon check-in. For more information on defining PDM variables, please see the chapter entitled “Variables” in the SOLIDWORKS PDM Administration Guide. Once a variable has been defined in SOLIDWORKS PDM, place the linked variable on a PDM data card to be managed. Now that a linked variable is entered on a data card, the file must be checked in to the vault to “push” the variable into the file. 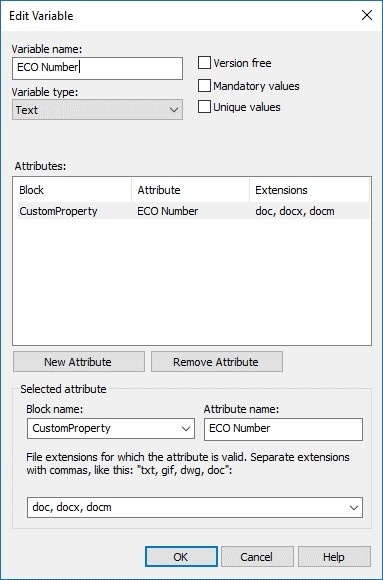 Microsoft Word can display content using property fields. 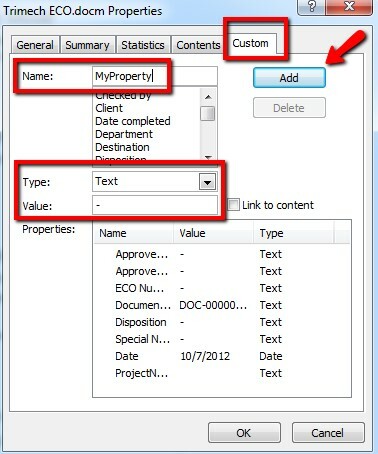 Follow the steps below to define the properties inside a Word document. From within Word, click on File then in upper right section, select the drop-down menu next to Properties, and select Advanced Properties. To access the custom properties, select the Custom tab of the Advanced Properties. 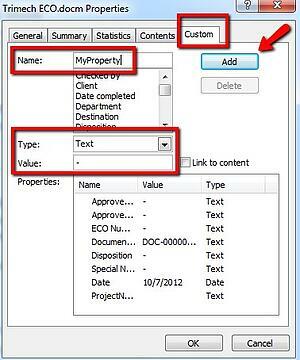 Define the custom properties and their values by giving the property a name, such as the PDM variable name. Define the type of a variable and give it a value. The value can be something such as “-“ as a placeholder. Click Add to create the custom property. Defining PDM variables, managing data cards and delegating property values will prepare you for creating custom form fields and enabling linking to SOLIDWORKS PDM. 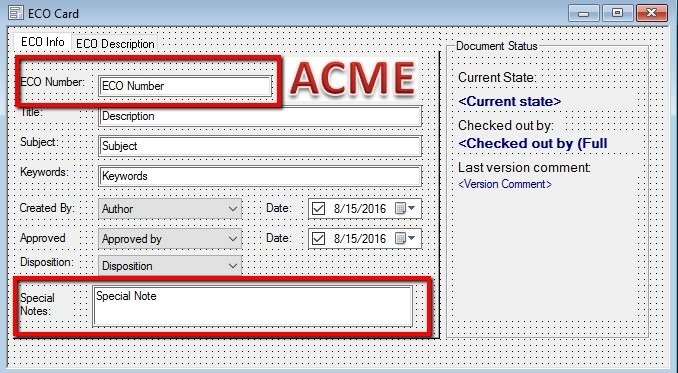 In the second half of our two-part blog series, we will break down the step-by-step process to refresh and enable linking to SOLIDWORKS PDM as well as have the variables be dynamically linked to the PDM metadata. While you wait, sign up for SOLIDWORKS PDM Training today!